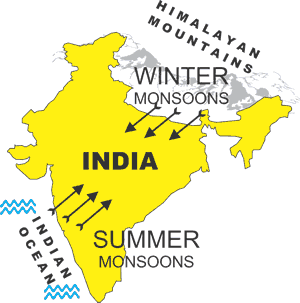 Monsoons dominate India’s climate. Monsoons are strong, often violent winds that change direction with the season. Monsoon winds blow from cold to warm regions because cold air takes up more space than warm air. So, monsoons blow from the land toward the sea in winter and from the sea toward land in the summer. India’s winters are hot and dry. The monsoon winds blow from the northeast and carry little moisture. India’s winters are hot because the mountains of the Himalayas form a barrier that prevents cold air from passing onto the subcontinent. Additionally, most of India lies between the Tropic of Cancer and the equator, so the sun’s rays shine directly on the land. The temperature can reach as high as 110°F during the Indian winter. The summer monsoons roar onto the subcontinent from the southwest. The winds carry moisture from the Indian Ocean and bring heavy rains from June to September. The torrential rainstorms often cause violent landslides. Monsoon rains have swept away entire villages. Despite the potential for destruction, many Indian people welcome the summer monsoons. Farmers depend on the rains to irrigate their land. In addition, the monsoons provide water power that generates electricity. Pakistan is drier than India. The summer monsoon winds in India bring moisture from the Indian Ocean; on the other hand, Pakistan is north of the ocean and receives much less rain. The Thar Desert lies on the border between India and Pakistan. It covers more than 77,000 square miles, which is an area about the size of Nebraska. Monsoon winds blow from cold to warm regions because cold air takes up more space than warm air. So, monsoons blow from the land toward the sea in winter and from the sea toward land in the summer. 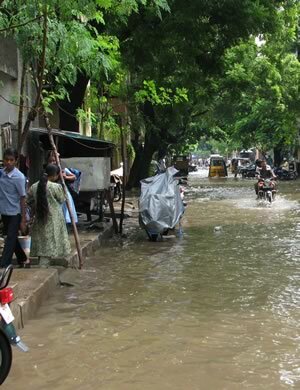 Flooding is common during monsoon season in India.